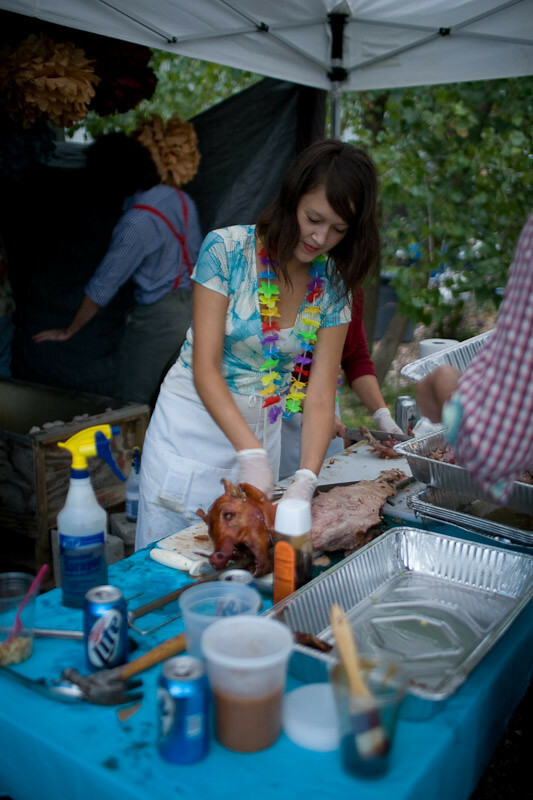 Last Friday, the Hapa Kitchen hosted a Hawaiian-themed “luau” at BKLYN Yard. It was also a pig roast, and my first stab at really carrying out that procedure (rather than just helping, or eating at ones before). From the horrified stares received while carrying a freshly slaughtered pig through a busy Union Square Greenmarket (which had been carefully wrapped in plastic to resemble a long-torsoed mummy), to being rejected by a cab driver for my strange-looking load, to figuring out how to refrigerate and brine the beasts overnight, to roasting them on a spit and in a wooden box, and finally, chopping their hot flesh and crispy skin before a sea of hungry eaters and cameras at the event, this has been a visceral, enlightening experience, and I want to reflect on that for a moment. As you can gather, I’m an omnivore, and though I’m having a strange phase with seafood now, I’m proud of cooking as well as eating everything. These days, most Americans tend to see meat only portioned off into pieces — wings, chops, medallions, etc. For that matter, I had never seen a carrot with its feathery greens still attached until I was maybe twenty, so many vegetables go through filtering from its natural state, too (i.e. “baby carrots”). The disconnect between food and its eater goes even farther when food is fully cooked as at a restaurant, or heavily processed, as in convenience or fast food. Many have commented on this gaping divide, but how good are we doing at reconnecting ourselves with the sights, sounds, smells and so-called unpleasantries of real food? It seems the only way to get better at it is by putting more “primitive”-looking foods back into public view. And cooking it ourselves. Off-putting, barbaric, inhumane — all these things could be said of a pig roast, or even a whole trout on a platter. But to many cultures throughout the world, showing off the animal is a sign of respect. It forces the diner to consider its life, and death. There’s also a strong communal aspect about eating a whole animal. Unless it’s quail, you’re cooking for many at a time, and there’s something oddly spiritual about eating the flesh from the exact same animal as everyone else at the table, as if you’re more deeply connected from that bond. (I really hope that doesn’t sound too weird or vampire-ish.) I know I get that feeling when a whole turkey is presented at the Thanksgiving table. There’s another benefit to eating, or purchasing whole animals: it’s more economical, and efficient. Compare the prices of a whole chicken to pieces cut-up, skinned or boned and you’ll quickly see. In a recession-stricken era, people are stocking their pantries with economy-size tubs of ketchup and toothpaste, so if we’ve got the room and muscle for that, we might consider making the extra effort of paring down sides of beef, or making room in the freezer for it. You’ll also get to use all the parts of the animal, like the bones or carcass of a bird for stock. Chicken livers make a savory mousse to put on crackers. 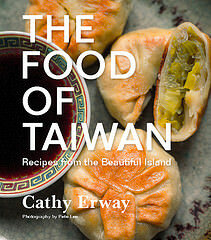 If gizzards are not your thing, perhaps you can save them for your neighbors, or for the next time you go fishing. Cooking an entire animal such as a pig on a spit is a tradition as old as eating itself. In this country, it enjoyed — and still enjoys — a strong following in the South. But as Nicole Taylor mentioned on Heritage Radio Network’s The Q Report yesterday, it’s waned in popularity significantly. However, a not-so-insignificant pig roasting renaissance has been happening in New York City: there was one going on yesterday at Roberta’s Pizza, a few weeks ago, at Third Ward, a July 4th one at Queens County Farm Museum, a “Big Brooklyn Pig Roast” last fall at the Yard, and there have been so many others. Here and there, more progress is being made to put meat back into perspective, from the butchering classes given by Tom Mylan at The Brooklyn Kitchen, to more restaurants purchasing whole animals to divvy up into numerous dishes. I’m excited to see where else it goes. It might not be the “whole” story, but cooking whole animals is definitely another layer to eating. I can understand the discomfort of whole animals, pig roasts, etc. if the observer is morally opposed to eating animals, but let’s face it (literally), this is the reality of eating meat. It may be extra work, playing butcher once in a while, but isn’t cooking extra work after all? And if you’re reading this site, then you’re probably in agreement that it’s worth the effort. I’ll end with a link to a site that made me feel much better after my pig-carrying trip through the Greenmarket. Since we’re talking about putting animals for food into public view, after all. Thanks to Josh for the discovery, who also took the photo at top. Well put. All I can say about this post is, I AGREE. Thanks, Cathy. Great post Cathy. Your point about the spiritual aspect of seeing / sharing the whole animal is very well put: when you understand that it was once a life, not just a shrink-wrapped package, you might give it, as you say, more respect. It reminds me why supermarkets feel so soulless!